We print on a variety of substrates from Hahnemühle, Moab, Canson, Inkpress, Epson to Awagami and using Epson’s highest grade archival pigment inks. Your prints are truly archival – with proper care they will last up to 200-400 years . Just like every artist’s medium, technique and practice are unique, so is our collaboration with you. Drop by, pop us an email or call to discuss the scope of your project. Hahnemühle: Photo Rag - 308 gsm, 18.9 mil. Hahnemühle Photo Rag® is one of the world’s most popular papers and the valued all-rounder for high-quality FineArt inkjet printing. 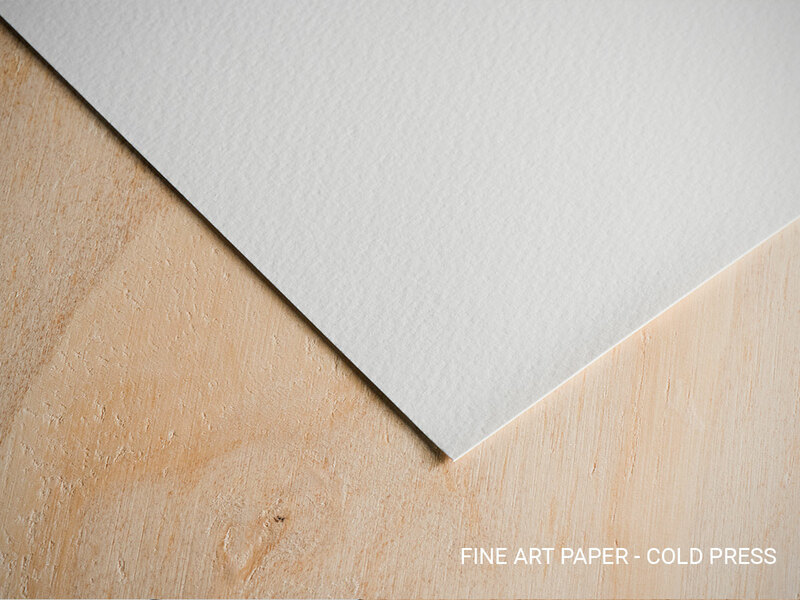 The white cotton artist’s paper, with its characteristic, wonderfully soft feel, boasts a lightly defined felt structure, lending each artwork a three-dimensional appearance and impressive pictorial depth. Combined with the matt premium inkjet coating, this paper produces outstanding prints that feature brilliant colours, deep blacks, striking contrasts and perfect reproduction of detail. Hahnemühle: Photo Rag Smooth - 305 gsm, 18.9 mil. With its extra smooth surface Photo Rag® Ultra Smooth is particularly of interest for users who want proven Photo Rag® quality but with less texture and a brighter white point. The matte premium inkjet coating guarantees extraordinary print results with impressive reproduction of color, detail and very deep black. Photo Rag® Ultra Smooth is versatile and produces impressive results for FineArt photography as well as art reproductions. The acid- and lignin-free all-rounder meets the most exacting requirements in terms of age resistance and is perfect for high-quality black and white FineArt prints. Hahnemühle: Torchon - 285 gsm, 19.7 mil. The term “torchon” is taken from the French and means “coarse structure”. 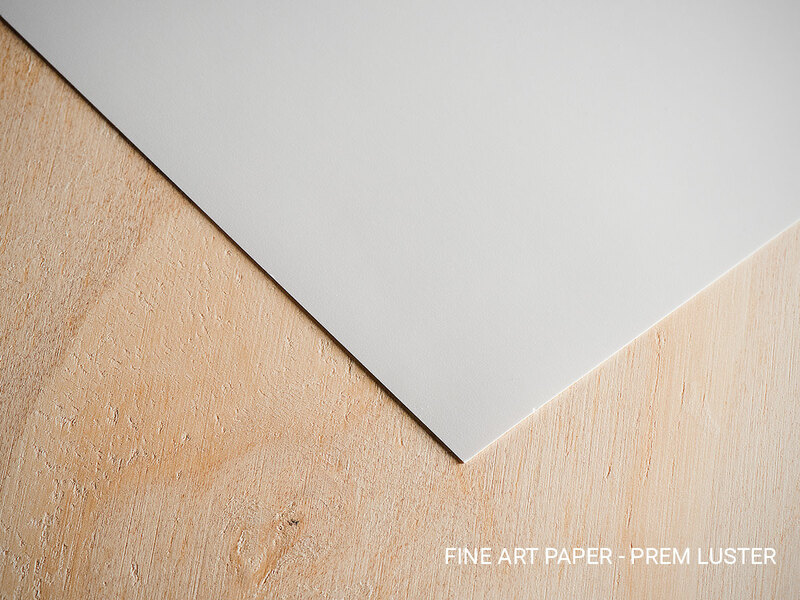 Even though it is named as a coarse structure paper, its special surface texture represents more of a rolling hill effect causing the paper to have a more mellowed & subtle texture than other papers in its category. It can capture the timeless original beauty and three dimensionality of an artwork in its own way. Hahnemühle: German Etching - 310 gsm, 19.7 mil. Hahnemühle German Etching is a traditional mould-made copperplate printing paper, complete with an inkjet coating designed especially for FineArt applications. 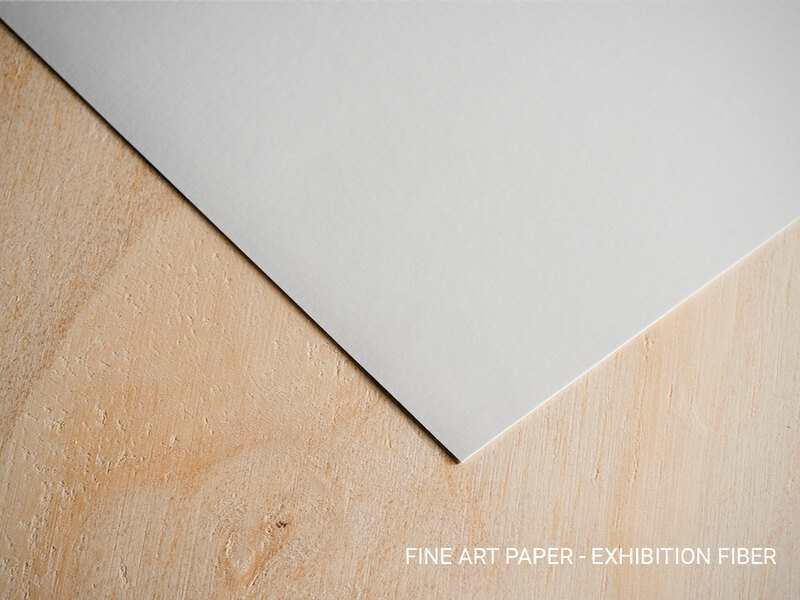 The white art paper made from 100% alpha cellulose is characterised by its extraordinary velvety tactile feel and its fine, clearly defined felt structure. This heavyweight etching board is velvety smooth with a fine distinctive surface texture. German Etching® is one of the most popular acid-free media worldwide for artwork and photography. Hahnemühle: William Turner - 310 gsm, 24.4 mil. With its matte watercolour texture this acid-free paper is a genuine mould-made paper in both look and feel. William Turner is ideal for reproductions of traditional artworks and also for striking and expressive photo reproductions. Epson: Hot Press Bright - 300 gsm, 17 mil. 100% cotton fiber paper with a smooth bright finish that delivers beautiful tonal transitions and a wide color gamut. Epson: Cold Press Bright - 305 gsm, 21 mil. A fine art paper with an elegantly subtle textured 100% cotton base and bright white surface. Hahnemühle: Bamboo - 290 gsm, 19.9 mil. Hahnemühle Bamboo is the world’s first FineArt inkjet paper made from 90% bamboo fibres, for a natural look and environmentally friendly paper production. The natural white, warm-toned bamboo paper does not contain optical brighteners, and stands out thanks to its soft, lightly textured felt structure and sensual feel. The matt premium inkjet coating produces excellent print results, with vivid colours, deep black and perfect reproduction of detail. Bamboo is acid- and lignin-free and meets the most precise requirements in terms of age resistance. The unique combination of sustainable bamboo fibers, soft surface texture and impressive print quality gives the artwork outstanding expression and soul. Hahnemühle: Rice Paper - 100 gsm, 5.9 mil. Awagami: Kozo Washi- 110 gsm, 18 mil. A Kozo (mulberry) based paper made on the mould embraces the tradition of Japanese Washi while providing a smooth matte surface reminiscent of hot press papers. Mulberry paper is sought after by artists and conservators because of its strength, translucency, and absorbency. The surface is both water resistant and acid free for longevity. A highly decorative and magnificent sheet of paper, adding depth to any print. Soft and lightweight and can be back-lit adding another dimension to your image. Awagami: Unryu Washi- 55 gsm, 13 mil. A traditional Kozo (mulberry) based paper made on the mould with added long course fibers making this paper seem like floating dragon clouds, hence the name ‘Unryu’. Mulberry paper is sought after by artists and conservators because of its strength, translucency, and absorbency. 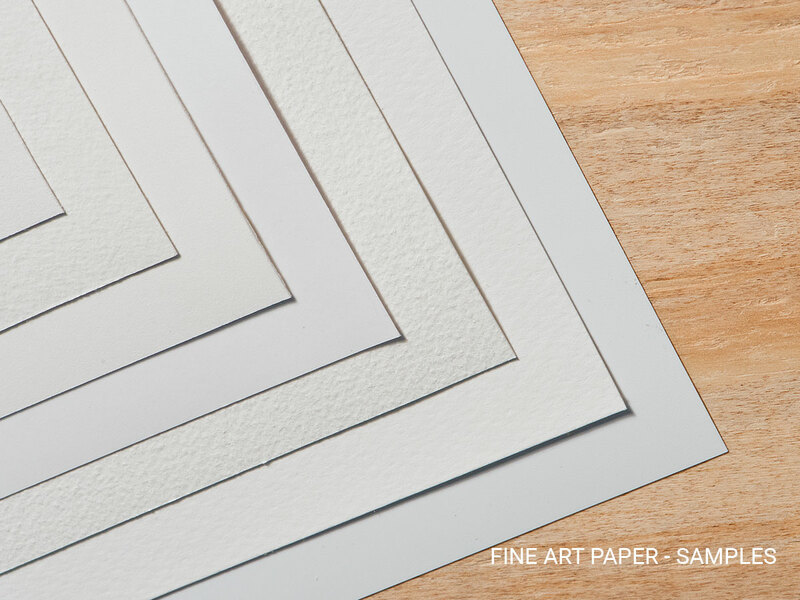 A highly decorative and magnificent sheet of paper, adding depth to any print. Soft and lightweight and can be back-lit adding another dimension to your image. Moab: Metallic Silver Photo Paper- 300 gsm, 12 mil. Iridium metallic finish gives every image a three-dimensional look! The resin coated paper is perfect for creating display and exhibition prints and as well home photo albums or portfolio work. The metallic quality of this photo paper lends itself perfect for mechanical, industrial, or architectural images. Epson: Premium Luster Photo Paper - 260 gsm, 10 mil. Epson’s high performing photo paper, features the same Luster E surface (orange peel) of traditional silver halide prints in fine lustre sheen. Delivers highly saturated prints by offering maximum ink coverage and a high D-Max for true photographic reproductions. Its 10-mil RC base gives prints a photographic feel, and keeps the paper cockle-free. Canson: Platine Fibre Rag Satin - 395 gsm, 15.6 mil. A combination of the premium 100% cotton Platinum paper Canson supplied for many years to the original darkroom photographic market, with the latest microporus coating, making this traditional darkroom paper now available in the digital printing industry. This paper provides extremely high D-max and exceptional grey tones with the aesthetic and feel of the original F-Type Baryta Fibre paper. Epson: Exhibition Canvas Matte - 396 gsm, 23 mil. Heavyweight, cotton/poly blend with a high Dmax, wide color gamut and non-reflective matte surface with bright white point . Gallery and museum-quality helps yields deep blacks and a wide color spectrum. Additionally, its elastic polymer coating resists cracking, making it ideal for large gallery wrap stretching. Epson: Exhibition Canvas Satin - 430 gsm, 23 mil. Heavyweight (even thicker than our Epson Canvas Matte substrate), cotton/poly blend with a high Dmax, wide color gamut and elegant satin surface making it excellent for gallery and museum-quality prints. It yields deep blacks and a wide color spectrum. Additionally, its elastic polymer coating resists cracking, making it ideal for gallery wrap stretching. Its satin (semi-gloss) finish adds an extra touch of class onto the final image and protects itself even more against damage. Inkpress Adhesive Vinyl - 350 gsm, 13 mil. An economical, universal, and permanent self adhesive material that works well in a wide range of applications. Versatile product for wall murals, photo-based or installation-based exhibitions, office graphics and home photo/decal usage. Breathing Color Art Peel Adhesive Matte - 314 gsm, 6 mil. Not your average printable wall fabric; it is designed to bring your art to life through outstanding print quality, deep, rich colors, and crisp resolution that your art deserves. Can be applied to nearly every smooth surface and remain adhered for a short-term or long-term usage. It is removable and can be short-term repositioned after being adhered. Versatile product for wall murals, installation-based exhibitions, office graphics and home photo/decal usage. Breathing Color Photo Peel Adhesive Vinyl Gloss - 325 gsm, 6 mil. High color brilliance vinyl adhesive can be applied to nearly every smooth surface and remain adhered for a short-term or long-term usage. It is removable and can be short-term re-positioned after being adhered. Versatile product for wall murals, photo-based or installation-based exhibitions, office graphics and home photo/decal usage. Epson Crystal Clear Film - 150 gsm, 4.5 mil. Designed for overlays, color key, graphics, photo-based or installation-based exhibitions. GSM: Grams per square meter – the measure of the substrate’s overall density/weight. MIL: Millimeter – the measure of the actual thickness of the substrate. We are able to print up to 44’’ wide at any given length. Don’t see the one you are looking for on our current roster? Let us know, it might already be in the studio. Want to produce a run of numbered edition prints? Got a solo exhibition to print? Let us know, volume discounts possible! Send us an email or come into our studio with some details about your project that you are looking to get produced and printed with us. Details like the image files, the sizes you want, the number of editions, paper stock of choice and your timeline would help us to determine and estimate accurately the scale of the collaboration with you. Afterwards, we will go over the images and analyze its quality to make sure the sizes and paper stock you want to print on will make your images truly “ah-mazing.” We will provide you with a timeline and cost of the project, after you approve it we will go ahead to the next phase with test strips. Test strips will be made and you will be contacted to come review them to make sure you are 100% happy about them first. If you aren’t able to review them in person, we can courier it to you for approval. Lastly, your images are then printed onto your substrate of choice. We will contact you once your prints are ready for pick-up. Want to mount or frame your prints? We have great connections in the city for that and can hook you up! Don’t live in Toronto or cannot pick up your art canvas yourself because of its size? We are able to deliver through our partnerships with various shipping companies, art movers to local couriers depending on your needs and location. Got a solo exhibition at the newly relocated MOCCA on Sterling Road? We will hand deliver and hang it up for you! Uncut & rolled, cut & laid flat. Average 2-4 business days after the approval of your test strip (if applicable) and dependent on the size of your print project. Got an exhibition around the corner and need it rushed? BAM, we can have that under control.